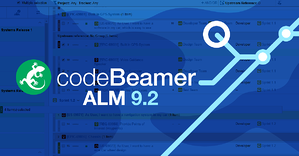 codeBeamer ALM’s latest version 9.2 was released on 9 July 2018. Read on to find out about the updates coming up in this new version, and watch the webinar announcing the release below! In 9.2, codeBeamer’s branching features are updated with permissions, reuse, and cross-branch references. Using the new version, you’ll be able to filter a list of trackers or other items, and create branches based on those items. Permissions for your branches may be set flexibly, allowing you to create immutable, private, or restricted branches. The new release also enables the reuse of work items across branches with their references maintained. You can even display requirements’ test coverage across branches. Overall, the new version makes it easy and seamless to manage different versions of requirement sets (and the test cases that verify them) across multiple product variants on multiple branches. The new Release Planner in codeBeamer ALM 9.2 introduces the brand new Story Plan feature which makes it easy for Agile teams to manage the development of complex products using a large volume of artifacts. With Story Plan, you can easily filter and group items in your backlog, and rearrange or prioritize that group of items across sprints or releases for simplified planning. One of our customers, a leading German automotive OEM uses this feature to group and manage together all the work items pertaining to a certain product component. For instance, you could group all the artifacts (including requirements, tasks, test cases, etc) related to rearview mirrors, and use simple drag and drop to move that group of items across sprints or releases. Stories help you focus on relevant bits of functionality, visualize them on a Kanban board, and manage the release planning of these groups with minimal effort. Story Plan is immensely helpful when you're developing complex products with multiple product components. After a complete makeover in codeBeamer ALM 9.2, sysadmins can now access and export a brand new Audit Trail Report. The new global audit functionality logs all user activities (including logins and logouts, permission changes, updates to work items, documents, fields, and deleted items) in your codeBeamer instance. You can configure the system to store a logged history of your instance for up to a year, and the recorded Audit Trail Report will include all changes to all your trackers, tracker fields, project roles, and user groups. With easy filtering options (based on date range, project, tracker type, or user) and PDF or Excel exporting, the new Audit Trail Report greatly simplifies audit preparations and gives auditors a one-stop shop for all compliance verification activities. Further improvements include enhanced security features, stability improvements, and the optimization of our Oracle database for unmatched performance. Interested in learning more about the features of this new release? Watch our webinar from 25 Jul 2018 below, or take the new version for a test drive.